The four unmarked jugs shown above will look familiar to all admirers of British stonewares. In this article, I speculate that these pieces1 were made under the auspices of a single family. While the Kisheres of Mortlake, who occasionally marked their wares,2 are well-known, the unmarked pots made by William Wagstaffe and his nephew, John Wisker have not been identified. These hunting wares were very widely produced throughout the 18th and 19th Centuries. They were the most “special” of the utilitarian brownwares3, and were found in every home as well as in commercial establishments. 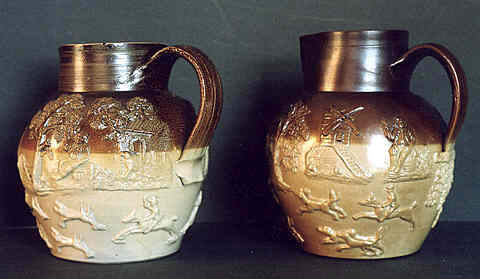 The more decorative jugs and mugs of the hunting type were used largely for the storage and serving of ale. This article will focus on early 19th Century wares (1800-1820), about which little is known which would associate particular pieces with the pottery where they were made. More recent surveys of eighteenth and nineteenth century hunting wares have also yielded important findings7. Noël Hume has considered the variants of a punch party scene which took a central place on the giant mugs of the mid 18th Century, as well as appearing on many Mortlake pieces of around 1800. 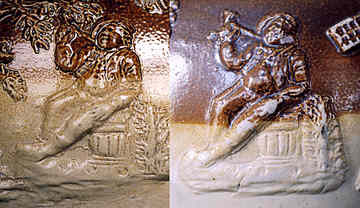 He suggests that, rather than being based upon Hogarth&apos;s Midnight Modern Conversation of 1731, the punch party plaque found from around this date may reflect a ceramic design by Hogarth made several years earlier. Despite these advances in scholarship, very little is known of hunting ware potters during the first half of the 19th Century, a period during which at least fifty British potters made brownwares, and in many cases hunting or other “figured” wares. Makers worked within a strong tradition, which can make many products from different sources appear surprisingly similar. However, the four jugs considered here appear, stylistically, to be from the first third of the 19th Century and probably from the London area. Ceramically, this means a long stretch of the South Bank of the winding Thames, from Mortlake in the west to Vauxhall, a part of Lambeth, on the western fringe of London proper. The two large jugs first illustrated are of Mortlake type and, I shall argue, represent the stoneware production of the Sanders&apos; pottery while under control from Vauxhall. They appear to span the W/W period, from 1805-25. According to what others have written, three distinctive sprigs tie jug A to the Sanders factory: the tall tree with gate, the dog emerging from a cottage and the tall windmill. The other large jug (B) is of later date, without neck ribbing and with an elaborate handle terminal (see Figure 5), based upon the so-called “standard early terminal” of overlapping leaves but with added, trailing hop blossoms. Its only “Sanders” sprig is the tree and gate, identical to that on jug A. Both jugs show other rare12 and, we would thus hope, distinctive, sprigs. “A” has a central plaque of two horsemen, probably hunters, with a dog on a cross-country ride, as well as a huntsman below with his crop raised over his head. 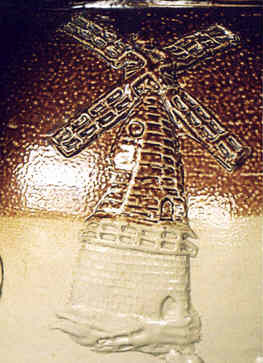 Jug “B” includes a sprig of a huntsman, about to cross a bridge over a rushing stream, as well as an uncommon windmill with a diagonal ladder and the miller standing in the doorway. 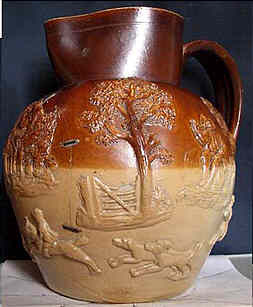 Although similar, the only direct link between these two jugs is the tall tree with gate. However, a similarly shaped, ribbed-neck jug to “A” published in Hildyard&apos;s Browne Muggs (#171) has the three sprigs (from Fig. 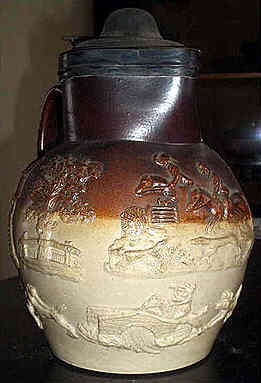 3, above) which he mentions as tied to Sanders, and he surmises that jugs of this group “may be products of Sanders&apos; pottery.” Another jug belonging to D. Holman of London has the two horsemen with dog from “A” and both the huntsman with bridge and the uncommon windmill from “B” (see Figure 10). Jugs A and B do thus seem to be very closely related. Two smaller (quart) jugs, “C” and “D”, are now illustrated as probably of the same W/W general origin. These two jugs show none of the larger sprigs already discussed but, as Mernick has plausibly shown, such sprigs may have been used only on larger pieces.13 The W/W attribution follows from the exact matches of some of their toper sprigs to those found on jugs A and B. Three grouped toper figures were introduced in the first decade of the 19th Century14, and they largely supplanted an earlier group of five toper types. Of these, Toby Philpott appears most prominently and in many versions. He was taken by several makers of sprigs from an engraving published, together with the mythic drinking song The Brown Jug, in 1761. The other two toper figures have been called the Thinker (facing to our right) and the left-facing Smoker. In contrast to the very varied representation of, say, trees, the two toper figures were standardized, with Thinkers and Smokers seeming to be archetypes adopted by one pottery after another. Figure 7 Thinker and Smoker topers from jugs A (left) and C. Note the impressed grasses on the base of both Thinkers. It is difficult to determine the origin or period of a jug from its toper figures, the dogs in the hunt, or their quarry. However, it may well be that the use of the three topers was introduced to Mortlake from Vauxhall. The jugs with topers but without characteristically Sanders sprigs could also have been made in Vauxhall. 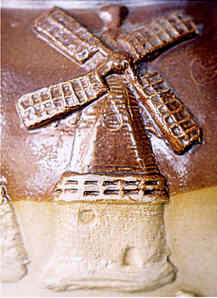 Figure 8: “tall windmill from Jug A (left), thought to be characteristic of Sanders&apos; Pottery, and smaller version from Jug C.
Each of the above three Tobies in our group of four jugs sits at a tripod table, wears a hat which looks like a sou&apos;wester, and has a prominent pocket extending to our right. Despite the difference in jug capacities from 2 to 6 pints, the Tobies are all the same size. 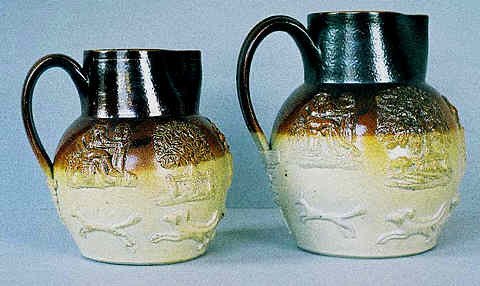 Figure 9: The three Toby sprigs from, left to right, jugs C, B and D.
This same Toby is shown, together with the huntsman with upraised crop from “A” (see Figure 4), on a two-handled mug which Noël Hume hesitantly attributes to “Derbyshire or Bristol,” but with little obvious justification.15 No other published photograph of this sprig has been found. Jugs “C” and “D” are thus strongly linked to “A” and “B” through their topers, but were they were made in Mortlake as opposed to Vauxhall? Some of our focus group of four jugs may have been made under Wagstaffe/Wisker management at Sanders&apos;, while some may come from their Vauxhall works. Two other jugs (“108” and “120S,”belonging to Philip Mernick and illustrated in Figure 10) have links to the above four focus jugs through distinctive sprigs (the “hops” terminal, Thinker on half-barrel and Toby with pocket.) #120S on the right shares only one distinctive sprig with the others, namely the tree and gate, and may be a rare example of a Sanders sprig used as part of a Vauxhall-made piece. It might be by Patrick, another Vauxhall potter. 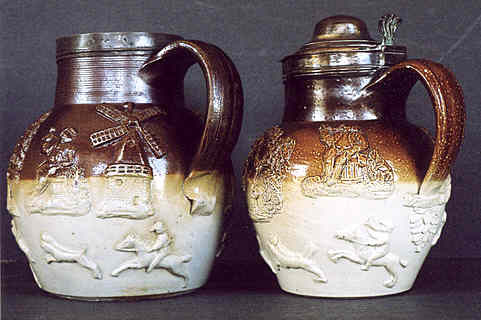 Figure 10: Three related jugs in London collections: D. Holman jug (left), Philip Mernick Jugs 108 and 120S, as discussed in text. In his overview of the hunting wares, Noël Hume16 presents another group of finely made jugs (his Figure 17), all with the “standard early terminal” and a rather simplified range of topers and trees. He identifies them as Mortlake or Lambeth (presumably including Vauxhall) 1830-35.
the #11, “curly tab,” terminal from OH&H, and which may well not be from London) is currently being examined by Mernick. Thus the hunting wares discussed above seem to represent around six London potteries (Sanders (W/W), Kishere, Vauxhall, Patrick, Fulham + 1?) all operating for much of the 1800-30 period. Presumably, Doulton and Watts are candidates for the unfilled “slot.” Before long, we should be able to distinguish these potters&apos; closely related hunting wares. The above potters sustained the “hunting” message for a generation, and laid the basis for the greatly increased production to come. I am greatly indebted to Ivor Noël Hume and Philip Mernick for their suggestions and criticisms, and for their continuing contributions to our discussion of British brownwares. 1. The above set of jugs came together as a unit when jug A was acquired: the latest to me but the earliest in date, and with the clearest links to what has been proposed by others about the Sanders production. The links then found between jug A and jug B, and between jugs B, C and D, allows us to propose a tentative story about the W/W potters. Such stories attempt to discover meaning, while they also create meanings which may turn out to be misleading. 2. See Jack Howarth and Robin Hildyard, Joseph Kishere and the Mortlake Potteries, Woodbridge, Suffolk: Antique Collectors&apos; Club, 2004, for the fullest account of the Kishere pottery. 3. 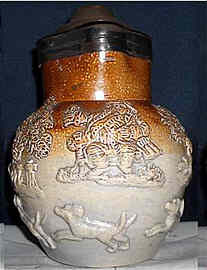 British brown stonewares were thoroughly covered by Adrian Oswald, with Robin Hildyard and R.G. 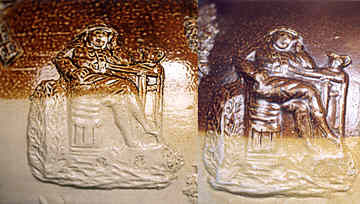 Hughes, in English Brown Stoneware 1670-1900, London: Faber and Faber, 1982 and by Robin Hildyard in Browne Muggs, London: Victoria and Albert Museum, 1985. 4. Since the potters tended to know each other, and to make agreements on pricing, it might have been embarrassing to copy exactly. 5. For accounts of these potteries, see the above-cited references and Derek Askey, Stoneware Bottles, Barnsley, S. Yorkshire, BBR Publishing, 1998. 6. Prominent mid-century makers include Doulton, Stiff and a handful of other London area potters, Bourne of South Derbyshire, Scottish potteries and some Bristol potters, usually in the lighter Bristol glaze. A very large number of C19 stoneware potteries were described in the 1980&apos;s by Hildyard and associates (see 3), and Hildyard and Howarth have recently surveyed the history of stoneware production in Mortlake, with special attention to the Kishere factory (see 1). 7. See, for example, W.W. Hamilton Foyn: “Dated London Brown Saltglazed Hunting Mugs 1713-75,” English Ceramic Circle Transactions, 17 pt. 2, 2000 and Ivor Noël Hume, “A-Hunting We Will Go! from Vauxhall to Lambeth, 1700-1956” in Ceramics in America ed. Robert Hunter, Hanover, NH: University Press of New England for the Chipstone Foundation, 2004, 179-245. 8. See Ivor Noël Hume, “John Bacon - Prince of Potters” in Ceramics in America, ed. Robert Hunter, Hanover, NH: University Press of New England for the Chipstone Foundation, 2005, 20-36. 10. See Nicholas Johnson: “The Hunting Jug and its Cousins,” in Antique Bottle Collector - UK, Nos. 16 & 16, 2002-3. In only a few cases do we know the maker and approximate date of hunting wares made in the 1800-50 period. Some makers sometimes marked or dated their wares, and excavations at certain pottery sites have also provided information. In these ways, some pieces - by Kishere of Mortlake, Patrick of Vauxhall, the White family of Fulham, Bourne of Derbyshire, etc. - can be identified. The vast majority of pots, made when hunting wares were becoming quite ubiquitous, are hard to identify and date. For example, there might be little agreement as to whether a mug is from Derbyshire, Yorkshire, Liverpool or Bristol. Ivor Noël Hume, in his characteristically entertaining If These Pots Could Talk, Milwaukee: Chipstone Foundation, 2001, 171-3, engages in such a puzzled discussion on the origin of a large beer jug. 11. The same is true of the venerable Vauxhall Pottery, down the river on the edge of Lambeth, at which the hunting mug had originated 100 years earlier. Although it was in operation until about 1830, no C19 pieces are known from it. For more on the relative sizes and production of the two Mortlake potteries in the 1810&apos;s see Jack Howarth and Robin Hildyard, Joseph Kishere ands the Mortlake Potteries, 35 et seq , 42 and 64, and Ivor Noël Hume, “A-Hunting We Will Go! from Vauxhall to Lambeth, 1700-1956” in Ceramics in America, ed. Robert Hunter, 194-5. Although the old Sanders works made both delftware and stoneware, it employed around a dozen men, more than the Kishere family could employ, and the property paid around three times as much in property taxes. 12. The sprigs described here as “rare” because they are almost unrepresented in the literature consulted. For example, I can find no illustration of the above windmill, even though Howarth and Hildyard show five (from Mortlake alone), Oswald, Hildyard and Hughes illustrate 15 and Noël Hume (A-Hunting We Will Go!) shows 18. The terminal with hops is similarly missing among up to 20 examples, and the tree with gate is similarly rare among trees. 13. Jug D appears to be the latest, and is linked to the other three jugs comparatively weakly, through its Toby sprig and perhaps its close-paired hounds. However, its domed lid suggests a date of no later than 1820. 14. Having been inspired by the sprigs on finer, dry-bodied stonewares of the Adams type, ca. 1800. 15. See Ivor Noël Hume, “A-Hunting We Will Go! from Vauxhall to Lambeth, 1700-1956” in Ceramics in America, ed. Robert Hunter, 2004, 211. Comparing these Toby sprigs raises the question of how similar they need to be to claim an identical origin. Many of the apparent differences between virtually identical designs can be explained by the need to remake working molds after they become clogged and the distortions inherent in their application to the curved surface of the pot. 16. Ivor Noël Hume, “A-Hunting We Will Go! from Vauxhall to Lambeth, 1700-1956” in Ceramics in America, ed. Robert Hunter, 2004, 179-245, Fig 17, 209.